Baking powder serves as a crucial leavening ingredient and it is found in a wide range of recipes for baked goods. But if you don’t have some handy when it comes time to bake, you will be able to get the same leavening effects with a simple substitute. 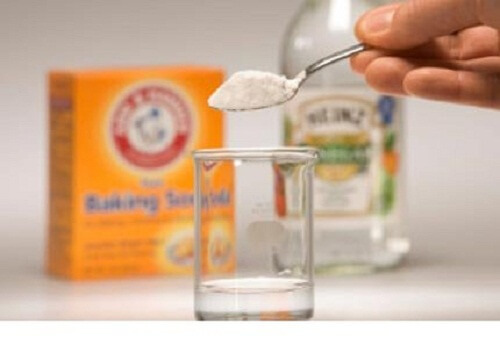 The most common method will be using baking soda with something acidic. To make these substitute recipes even better, some of their ingredients are cheaper than actual baking powder. The following are the basic guidelines for creating the substitute. The general rule of thumb is that for each teaspoon of baking powder found in the original recipe, you should use a ¼ teaspoon of baking soda along with an acid. Nearly every single recipe that replaces baking powder will do so with baking soda as it is the base within an acid-base reaction that mimics the leavening you would get from baking powder. Since baking soda is roughly four times as powerful as the baking powder, you need to divide its quantity by four. The acidic ingredient’s volume will vary. While baking soda will typically be a part of your baking powder substitute, the acid will change. You want to choose one that works well with your recipe. Don’t be concerned about the acid leaving a sour taste as the reaction it has with baking soda will mostly neutralize this. That being said, some parts of the acid’s flavor will stay. Because of this, sweet cookies will do well with baking soda paired with molasses if no baking powder is on hand. When using baking soda and an acid as a substitute, keep in mind that the reaction occurs as soon as the ingredients mix and eventually slows down and stops. Because of this, you should combine the two right before the mixture goes in the oven. The easiest way to do this is to add the baking soda to your dry ingredients and the acid to the liquid ones. Here are a few simple recipes for baking powder substitute. 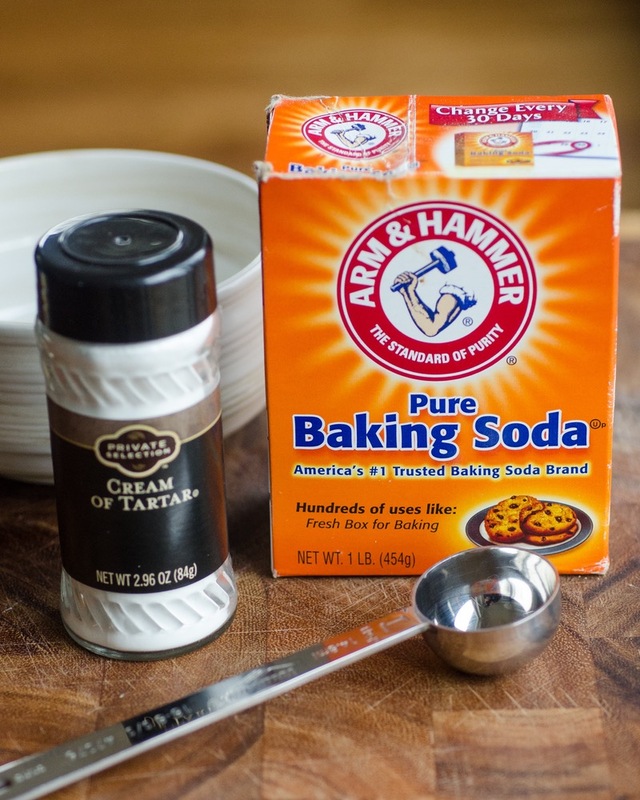 Mix ½ teaspoon cream of tartar for every ¼ teaspoon baking soda. Cream of tartar is easy to find and powdery. When it is paired in a baking soda ratio just over 2:1, it works well to substitute baking powder. Despite being a powder, you should still add it to your liquid ingredients. An alternative is to prepare this substitute ahead of time. Mix cream of tartar with baking soda in a ratio of 2:1 and then add the same amount of cornstarch as baking soda. This will absorb moisture in the air, stopping the ingredients from prematurely reacting. Mix ½ teaspoon of lemon juice or vinegar for each ¼ teaspoon baking soda. Just add the vinegar or lemon juice to your wet ingredients and the baking soda to the dry ingredients for this baking powder substitute. 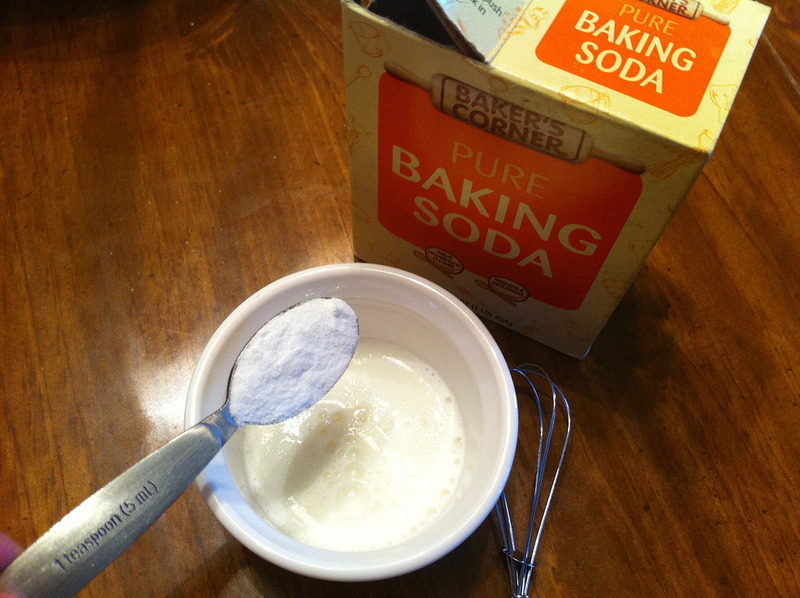 Mix 1 cup sour dairy per ½ teaspoon baking soda. Sour dairy options include sour milk, yogurt, or buttermilk. These dairy items taste sour because of their acidity which is what lets them react. Because of the quantity of dairy needed to balance the baking soda, you will have to reduce other liquids used in your recipe. Consider removing the same amount of liquid from the recipe that you will be adding via the sour dairy product. 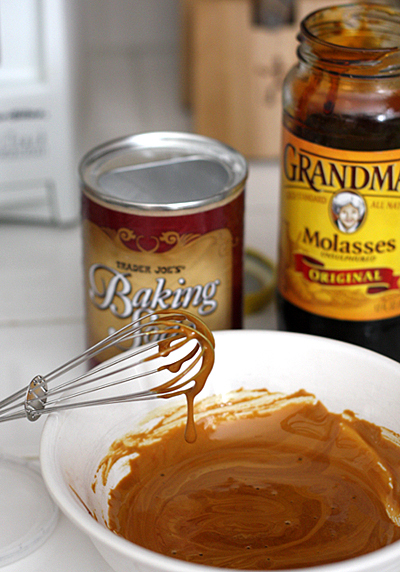 Mix ⅜ cup molasses, treacle, or golden syrup per ¼ teaspoon baking soda. These thick kitchen sweeteners are actually acidic, meaning they will cause the desired reaction with baking soda. Remember to add the molasses, treacle, or golden syrup to the wet ingredients and the baking soda to the dry ones. Like with using sour dairy, the acids here are in large enough quantities to affect your baking proportions. Because of this, get rid of an equal amount of other liquid from your recipe as the molasses you use. Keep in mind that molasses is incredibly sweet so you may want to reduce other sweeteners in the recipe. To get a better idea of how these substitute options work in practice, check out this delicious recipe for molasses muffins. Cream together the oil or melted butter with brown sugar. Then, stir in the eggs, milk, and molasses, beating until the mixture is smooth. Using a separate bowl, combine the spices, flour, baking soda, and the salt. Combine this mixture with the wet ingredients, blending until it is fairly smooth. 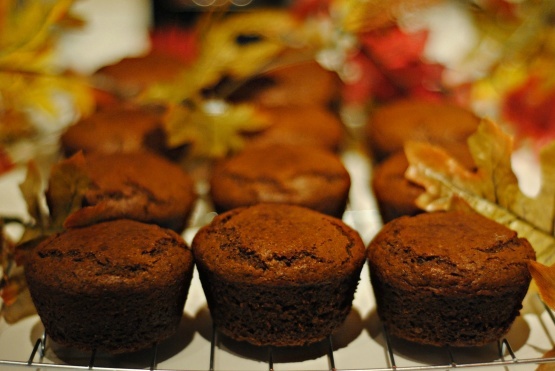 Spread the batter in paper-lined or greased muffin cups. Bake 18 to 25 minutes, when the middle springs back if touched. Let cool slightly and add optional butter.